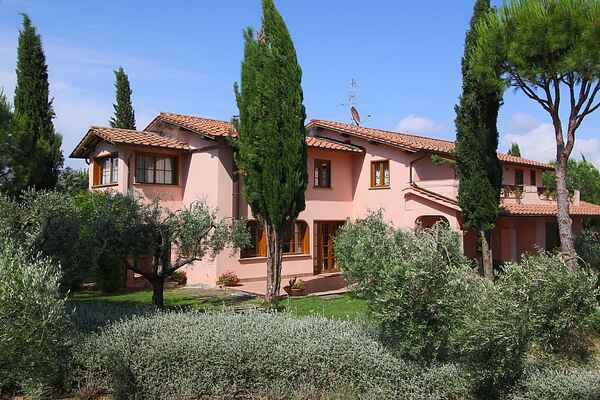 Villa Maremma is a beautiful villa in the Maremma region on a hill and is surrounded by beautiful vineyards. There is a beautiful 360 degree view of the sea to the green of the Maremma region. The villa is light, elegant, comfortable and decorated in warm colors and is ideal for a large family or group of friends. The garden is beautiful with all the flower beds and Mediterranean herbs, scattered along the lawn. There is a swimming pool, a children's pool and a Jacuzzi. The villa consists of three floors. On the ground floor is a spa and fitness area and a billiards room. The beach and the sea is 8 km away from the villa. The managers who live on the grounds of the villa in an outbuilding on request make dinners or lunches ready with all local specialties. They also organize wine tastings on request. The villa is an ideal base for trips to unique places like Talamone, Castiglione della Pescaia, Argentario, Pitigliano, Sorano and the thermal baths.